Light bulb!! We just got THE best idea ever! Buy this envelope. Know someone who needs to be cheered up? This envelope color will surely do the trick, along with an enormous amount of compliments in the letter you decide to send. Did that make you chuckle at least? No? We’re going to try one more time, and if not then maybe JAM will send you this pleasant colored envelope. *Looking up jokes with the word yellow in them* Okay fine, we give up. But we do know that these envelopes are great for when you're sending out your baby shower cards, and want to keep the gender a secret. Yellow is the neutral color between the two, right? 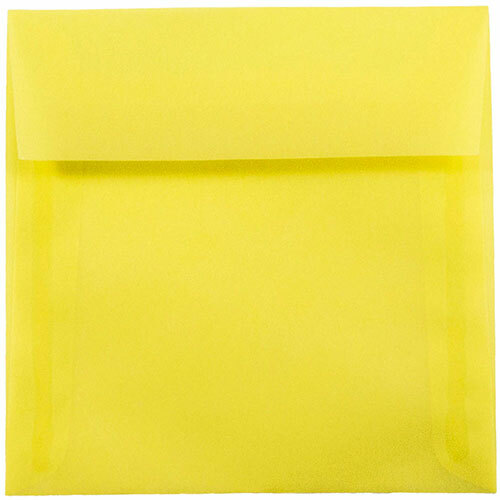 Yellow 7.5 x 7.5 Square Envelopes are available in a Light Yellow color called Lemonade. Refreshing for a summertime mailing.